Advancements in chemical technology and an escape from traditional thinking enabled TERLYN INDUSTRIES to develop a revolutionary, high performance boiler water treatment program. TERLYN’s “BWT” series Boiler Water Treatment is designed for use in steam boilers up to 350 PSI, and will remain stable at temperatures in excess of 300o C. The performance of this advanced technology treatment has been proven throughout the United States on a variety of comfort heating and process applications. It is used on many different boiler types including: Horizontal Tube Boilers, Vertical Tube Boilers, Railroad Locomotive Steam Boilers, Scotch Boilers, and others. This program offers unprecedented advantages and substantial savings over traditional treatments and will eliminate the long term problems related to those programs. The traditional approach attempts to eliminate scale buildup by using a combination of different chemicals including high level phosphates. This approach forces hardness and other solids present in the water to the bottom of the boiler where they collect to form a thick, mud-like, sludge. In order to reduce the buildup of sludge and total dissolved solids during boiler operation, bottom blowdown is required. Unfortunately, bottom blowdown is not completely effective and sludge builds up on the tubes and in the columns. This buildup eventually causes uneven heat transfer, loss of efficiency, faulty operation of critical low water cutoff systems and corrosion. Because of this, annual cleaning with detergents and/or acids is common with traditional boiler treatment programs. The TERLYN approach to boiler treatment is innovative. Instead of precipitating the solids out of solution, TERLYN “BWT” treatment bonds with the hardness elements and holds them in solution. This is possible because of the extremely high molecular bonding strength of this advanced technology treatment. One ion of TERLYN treatment will hold approximately 3000 ions of hardness in solution. Even under the severe conditions of intense heat and pressure created inside a boiler, the solids stay in solution, unable to fall out and form scale. The bonding characteristics of this treatment are so advanced that it not only protects the boiler from scale buildup and corrosion, it also removes existing scale. The results are exceptionally clean boilers and extremely low corrosion. blowdown. In the case of comfort heating steam boilers with high condensate return, TERLYN “BWT” can eliminate the need for bottom blowdown. On these systems, blowing down the glass columns to check low water cut-off switches is typically enough to maintain TDS and proper boiler operation. The TERLYN “BWT” treatment program will save heat energy, reduce boiler maintenance, and simplify testing on all boilers. 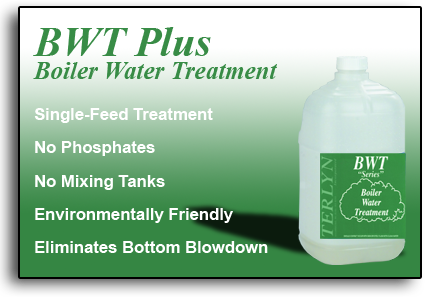 TERLYN “BWT” is safe to handle and does not use phosphates (an acknowledged environmental hazard). Years of laboratory and field testing have proven TERLYN “BWT” to be the most effective treatment available. “BWT” will prevent the buildup of new scale, remove existing scale deposits, and reduce corrosion. . The TERLYN “BWT” program will maintain peak boiler operating efficiency and eliminate the need for annual cleaning. State inspectors have declared boilers treated with TERLYN “BWT” to be the cleanest they have ever seen.